Hello and welcome to another fun blog hop! Today I'm ringing in the new year with a great group of crafters - the entire lineup is posted below, so be sure to visit everyone for some inspiration. If you've been here before, you may know that I mostly scrapbook in two-page layouts, which sometimes leaves me struggling for leading and end pages for each year's album. So this hop inspired me to plan ahead for a change, and I made this layout for New Year's Eve before I even took the pictures. I cut the champagne flutes from vellum using the Cricut Artistry cartridge, and the champagne is cut from the same pattern paper I used for the photo mats. I added a gold puffy sticker for the "clink". For my title, I used a coordinating sticker from the kit for Celebrate. Then I cut New Year's Eve with Artistry, again using that same pattern paper to tie everything together. I cut a journaling card from one of the sheets in the kit and rounded the top corners so it would match the chipboard phrase I wanted to use. I adhered it right at the bottom edge of the page to ground it, then added the chipboard and a gold puffy sticker. Thanks so much for checking out my project! If you're interested in any of the products I used, I have a photo shopping list at the bottom of the post linking to my website. But be sure to continue the hop and visit all of these inspiring blogs today! Hello and welcome to our first blog hop of 2016! If you've arrived here from Maureen O'Sullivan's Something To Scrap About blog, or if you're just starting out, you're in the right place. I combined this stamp set with items from the La Vie En Rose collection - perfect for a more formal look for my concert pictures. I added kraft pieces and plastic die-cuts from the Complements pack, some gold foil tape, and a few white Enamel Gems from the Grey pack. I used a sketch pattern from Make It From Your Heart Volume 1 to create my layout. You may notice that my flowers do not look flat like you might expect from a stamped image. I have an easy technique I use to give flowers dimension, so I thought I would share it with you. 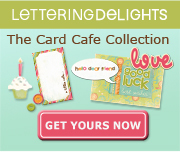 Start with a cut out image and the foam pad that comes in the stamp set. Place the image face down on the foam pad. Use an embossing tool to rub in a circular motion over the image, starting large and moving in to the center. Start with a lighter touch and gradually add pressure to create a domed shape, being careful not to press so hard that you tear the cardstock. A completed flower! Adhere them to your project using 3-D Foam Tape to keep the shape. Thanks for checking out my project! If you'd like to shop, the photo list below contains links that open in a new window so you don't lose your place in the hop. When you're ready to move along, we'll hop over to Jen Rubio's blog to see her inspiration for us this month. Welcome to the National Cat Day Blog Hop! If you came from Sarah's Blog you are in right spot. But you want to start the fun at Haidee's Blog if you happened to start out here. I am excited to have you hop with us! 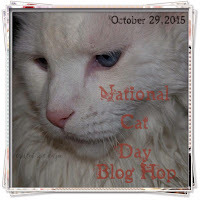 Each blogger participating in this hop is featuring a crafty project having to do with "Cat". You'll find unique ideas that have to do with Cat. We hope you'll enjoy each and every project along the way. There are just a few steps to make these, and they are super quick! 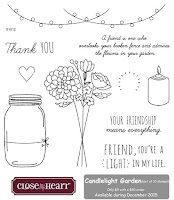 First, choose your Cricut image and decide on size. I cut my cat at 2.5". Cut from Contact paper using the settings you use for vinyl, but with less pressure so you don't cut through the backing paper. Peel off your cat and position it on your mug as desired. Next, use your paint pen or marker around your image as desired to create the negative image. Because my paint pen had a brush nib type tip, I chose to show these two options - the left uses a flicking motion out from the center and the right uses a splotchy dot effect. I colored the heart cutout solidly on both. When you're done with your image, carefully peel off the contact paper. I used the pointed hook Cricut tool to carefully peel it up while my paint was still wet. After drying, follow the curing directions for your paint/marker to make it permanent. (Mine baked at 325 degrees for 30 minute.) Remember that these should now be hand washed, even if the original mugs are dishwasher safe! 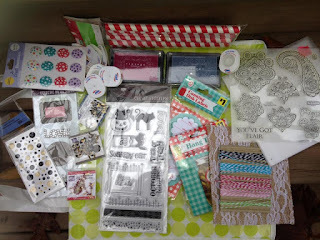 Your next blog stop is Nana's Scrap Spot.